Ms. Neiger has been an Ann’s Choice resident with her husband for over 12 years and is newly appointed Director Living in the Community. 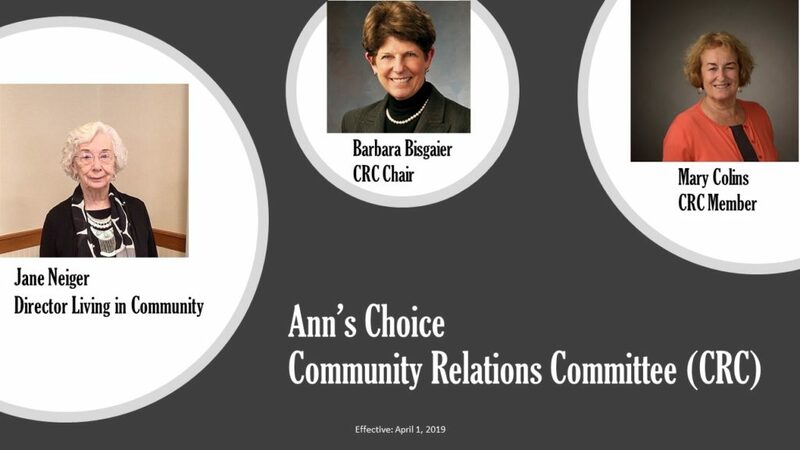 Ms. Neiger has been an active member of the community by serving as Chair on Ann’s Choice Resident Advisory Committee for one year and as a member for four years. She has chaired the Safety Committee, was member of the Ann’s Choice Finance Committee and is a current member of their Diversity & Inclusion Team. Ms. Neiger served on the Benevolent and Gala Committee, chaired the Entertainment committee and volunteers in the continuing care community. Her roles also include Director of Camp Onas for 31 years for the Friends Camp Assoc. of Pa., a 501(c) nonprofit organization that owns and operates Camp Onas, a residential summer camp and meeting facility. Ms. Neiger also worked in the education field as a teacher’s assistant with children with special needs for 10 years.